Similar charts of the past 10 year can be found here. You can find other silver charts from intraday up to 3 year here. Well, on the chart below you can see if that is true for yourself in the case of silver for the past 5 years. What can you see on this chart? You can calculate silver’s 1 month return from silver’s price today and silver’s price 30 days ago. You can also do the same calculation for yesterday and silver’s price 31 days ago etc. If you do this calculation for each days, you will get a curve of silver’s 1 month yield. The same applies to other yield periods from three months to five years. This chart shows each yield curve in the past 5 years. It helps you to highlight how stable profits were. 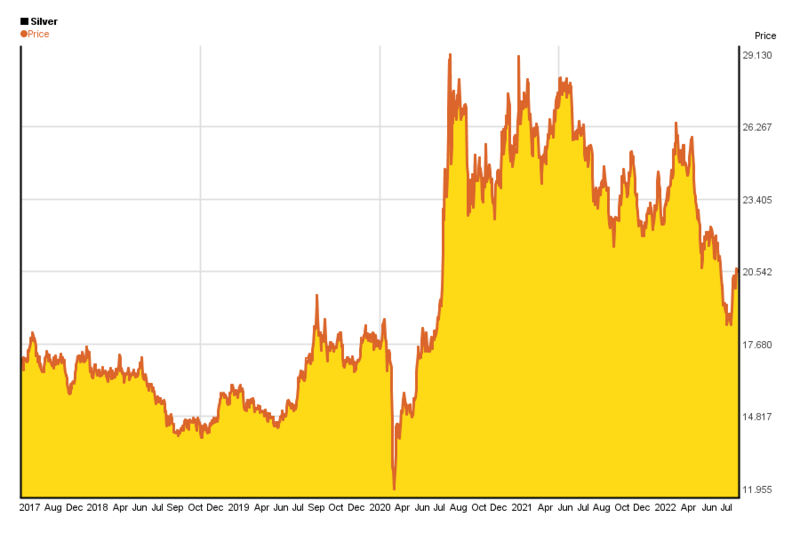 Financial crysis in 2008 has also boosted silver’s price. But wasn’t cca. 50$ too much for 1 oz of silver in 2010’s? Was silver worth more in the past? As you can see, current peak is far from silver’s peak value on Silver Thursday in 1980. 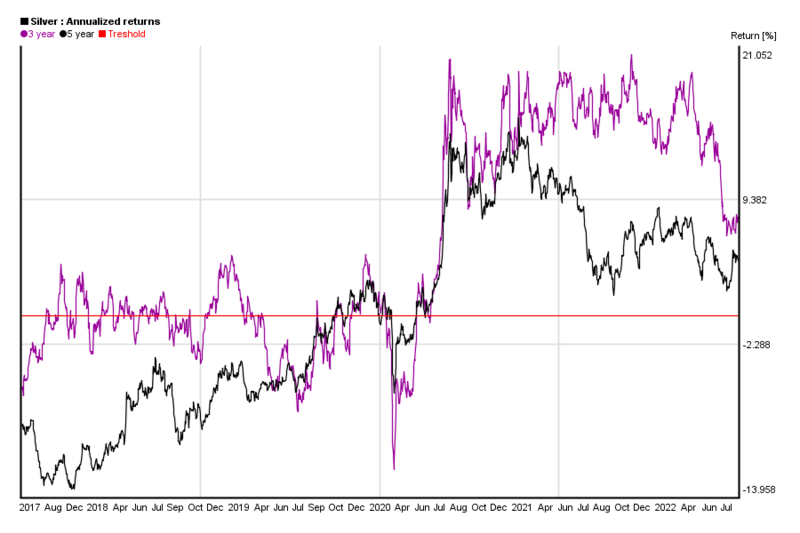 On the other hand this does not mean that silver price will have to go higher – past behaviour does not represent any guarantee for future performance. *charts are updated every month, and they have been created by using Chartoasis Sesame. 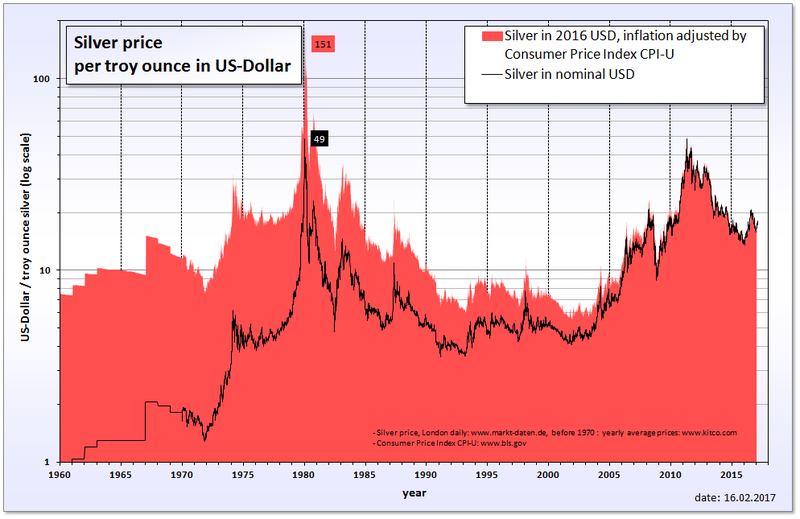 If you feel like analyzing silver’s historical prices, you can do that for free at www.chartoasis.com/sesame . You can download silver’s historical data using this step-by-step guide.